Is tonight the Nats' night? 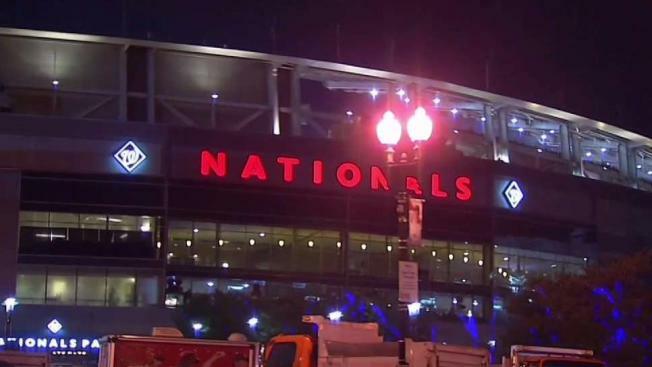 The Washington Nationals are taking on the Chicago Cubs again Saturday night, after losing 3-0 in Game 1 of their National League Division Series. Veteran left-handed pitchers Gio Gonzalez, of the Nationals, and Jon Lester, of the Cubs, match up in Game 2. Lester, who's 13-8, was set to start for the defending World Series champions against 15-9 Gonzalez. 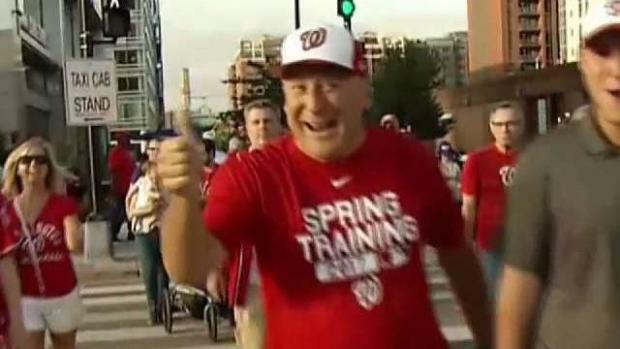 Washington Nationals fans are putting their hopes on their home team and traveling far and wide to see them faceoff against the Chicago Cubs. News4's Wendy Rieger, Doug Kammerer and Julie Carey report from Nats Park. On Friday, two-time Cy Young Award winner Max Scherzer was pushed back to Game 3 because of a tender hamstring. Lester won his final two starts, allowing one run over 11 innings, after compiling an 8.22 ERA in his previous five games. He is 9-7 with a 2.63 ERA in his postseason career. Gonzalez said he had been preparing to pitch Monday at Wrigley Field until he was told Wednesday to get ready for Game 2. On Friday, the Cubs opened defense of their first World Series title in 108 years by beating the Nats. Kris Bryant and Anthony Rizzo produced RBI singles in the sixth inning for the first two hits off an otherwise-dominant Strasburg. Hendricks was even better, giving up only two singles in seven strong innings. Rizzo added an RBI double off reliever Ryan Madson in the eighth. Carl Edwards Jr. threw a perfect inning and Wade Davis finished the two-hitter for a save. Strasburg didn't allow a hit until there were two outs in the sixth. Javier Baez reached on third baseman Anthony Rendon's error to start the inning and was sacrificed to second by Hendricks. One out later, Bryant drove in the first run with a single to right-center and went to second when Bryce Harper missed the cutoff man. The next batter, Rizzo, singled to right in front of a diving Harper to make it 2-0. With a heavy beard and a lot of sweat on a muggy, 77-degree night, Strasburg dialed up his fastball to 97 mph and occasionally used an unhittable changeup. To cheers of "Let's go, Strasburg!" from many in a sellout crowd of 43,898, he held the Cubs without a hit for 5 2/3 innings and wound up with 10 strikeouts, a playoff record for the Expos-Nationals franchise. In only his second postseason appearance -- remember the shutdown of 2012 and the arm injury of 2016? -- the righty showed precisely the sort of power and poise that made him the No. 1 pick in baseball's amateur draft. Until, that is, the sixth inning. That's when everything changed in a matter of minutes. Until then, the Cubs managed only one baserunner, and that was via a walk. But Baez led off with a bouncer that Rendon gloved, then bobbled while trying to transfer it to his throwing hand. It was Rendon's first error since July 22; he made only seven in 145 regular-season games. After Hendricks' bunt moved Baez to second, 2016 NL MVP Bryant lined Strasburg's 60th pitch, a four-seam fastball, to right-center for the game's first run. Harper's throw missed the cutoff man, and Bryant took second. Two pitches later, on another fastball, Rizzo sent a sinking shot to right, where Harper came up just short trying to make a diving catch, and suddenly it was 2-0. As pitching coach Mike Maddux came out for a mound visit with Strasburg, Rizzo whooped it up at the bag, high-fiving first base coach Brandon Hyde. Strasburg wound up allowing those two unearned runs in seven innings, with three hits and one walk. Hendricks went about things differently -- his best fastball is about 10 mph slower than Strasburg's -- but was every bit as good. The slender righty from Dartmouth, who led the NL in ERA last season, did not give up a hit after the second inning. He walked three batters and struck out six. In the Washington ninth, Ryan Zimmerman was called out when catcher Willson Contreras' throw hit the player in the back as he ran to first on a dropped third strike. While the Cubs are no longer the "Lovable Losers'' after last year's championship, the Nationals were the NL East champions for the fourth time in six seasons but have yet to win a playoff series. Their undoing in the past has often been poor hitting and bad relief pitching, and it was the former that was most glaring this time. Yes, Harper -- wearing shoes with "Pray for Las Vegas" written on the side following the recent mass shooting in his hometown -- did single in the first inning, but was 0 for 3 in his other at-bats as he tries to regain his timing after returning recently from a long injury layoff. Rendon, Zimmerman, Daniel Murphy, Trea Turner and Jayson Werth were a combined 0 for 17 with three walks. Less than a half-hour before the game, the Nationals announced that assistant hitting coach Jacque Jones has been suspended with pay pending an internal investigation. The team said the suspension is connected to a legal matter. The 42-year-old Jones retired as a player in 2008 after 10 years with four teams. House Majority Whip Steve Scalise threw out the ceremonial first pitch, less than four months after the Louisiana Republican was shot while practicing for an annual charity baseball game featuring members of Congress. Scalise returned to the House last week.